On the 18th of January 2014 the Chairman & CEO of our company Mr. Rolf M. Alter was honored by the city of Echternach in a ceremonial act with the „Bene Meritus“ award 2014 for his outstanding achievements. 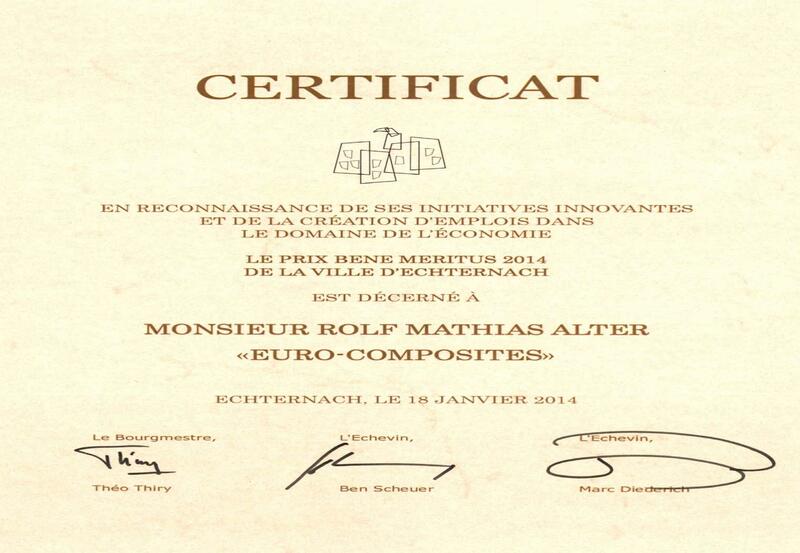 The „Bene Meritus“ was awarded this year for the first time by the city of Echternach. With this award the city of Echternach honors the innovative and entrepreneurial spirit combined with the sustained creation of employment. With more than 800 Employees EURO-COMPOSITES® S.A. is one of biggest employers in the industrial sector of Luxembourg and one of the biggest suppliers of composite material in the aviation industry worldwide.